Reservists work and train alongside Regular RAF personnel, serve in both the UK and overseas and are deployed on operations. Part-Time Volunteer Reserves (PTVR) bring to the RAF skills from their ‘day job’ and take back skills learned in the RAF. 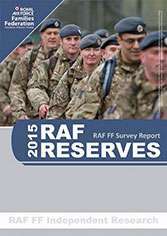 What does the RAF Families Federation do for RAF Reserves? The RAF Families Federation (RAF FF) is funded by the RAF to gather evidence of issues and concerns affecting all RAF personnel and their families. Following the renewal of our contract in June 14, we were specifically tasked to engage with the RAF Reserve community. As part of that process, we conducted on-line surveys and ‘live’ workshops to gather evidence of the RAF Reserves’ experience. 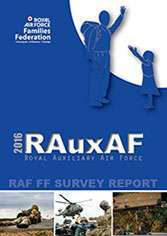 You can read the results of the evidence gathering in the 2015 RAF Reserves survey report and the 2016 RAuxAF survey report. Why not join our Reserves Facebook Group and be in touch with colleagues or browse the RAF Reserves’ website. Image: A reservist Gunner with 504 (County of Nottingham) Squadron, Royal Auxilliary Air Force fires a machine gun during two weeks Annual Continuous Training at Hythe Range Complex. Contains public sector information licensed under the Open Government Licence v3.0.